On Wednesday, August 15, 2018, from 2–3 PM EDT, Felicia D. Stoler, DCN, MS, RDN, FACSM, FAND, will discuss food allergies/intolerances, SIBO, FODMAP, IBS, motility issues, and GERD, and provide practical strategies for assisting with symptom management. List common digestive issues experienced by the general population. Compare and contrast the nutritional interventions to symptom management for common digestive issues. Discuss commonalities between nutritional interventions for symptom management of common digestive issues. Dr. Felicia Stoler — America's Health & Wellness Expert™ — is a registered dietitian nutritionist, exercise physiologist and expert consultant in disease prevention, wellness and healthful living. She has a bachelors from Tulane University, a masters in applied physiology and nutrition from Columbia University and doctorate in clinical nutrition from Rutgers University. Felicia serves on many local, state and national committees related to health and wellness. Felicia is Fellow of the American College of Sports Medicine, a Fellow of the Academy of Nutrition and Dietetics; and a Council member of the True Health Initiative. Felicia recently became a diplomate of the ABLM/ACLM — the inaugural class of Lifestyle Medicine Board Certified professionals. Dr. Stoler hosted the second season of TLC's groundbreaking series Honey, We're Killing the Kids! and the author of Living Skinny in Fat GenesThe Healthy Way to Lose Weight and Feel Great (Pegasus). She has been a contributor for FoxNews.com, the Patch.com, Active.com and written several book chapters. Stoler authored ACSM’s Sports Medicine Basics on Childhood Obesity. Felicia is one of the most sought-after nutrition/fitness experts for TV, radio, newspapers, online and magazines in the US. She is passionate about helping people live healthier lives. 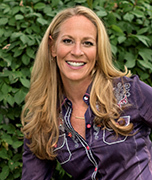 She maintains a private practice in Red Bank, NJ and has a production company called Jersey Girls Productions. Wherever you go, go with Regular Girl. It’s a synbiotic blend of clinically proven prebiotic fiber and probiotics that help support a healthy digestive balance, so you can feel your best from the inside out. Unlike other fiber that moves through your body too fast or too slow, Regular Girl moves at just the right pace so you can say ba-bye to occasional constipation and diarrhea without excess gas or bloating. Regular Girl is Low FODMAP Certified, Non GMO Project Verified, Kosher and now USDA Organic! It’s tasteless, colorless and odorless. So fabulous! Because life is anything but regular. Felicia D. Stoler, DCN, MS, RDN, FACSM, FAND, reports the following relevant disclosures: she serves as a consultant to and/or received honoraria and other financial support from Berg Imports, LLC; Diem Labs, LLC; Malaysian Palm Oil Council; Regular Girl and Taiyo International, Inc. She has certified that no conflict of interest exists for this program. View our disclosure policy.